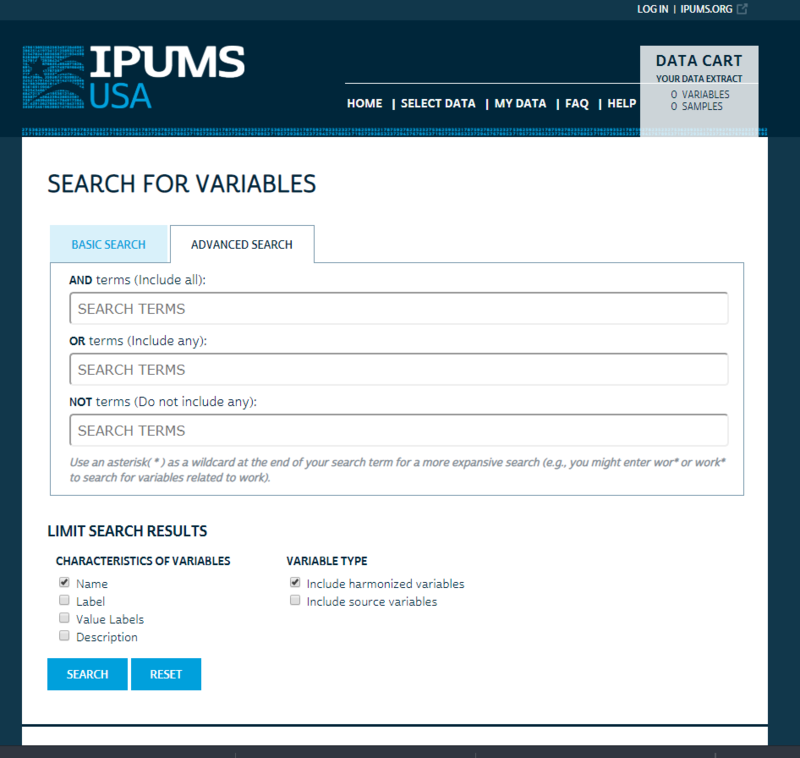 IPUMS Search has a New Look! 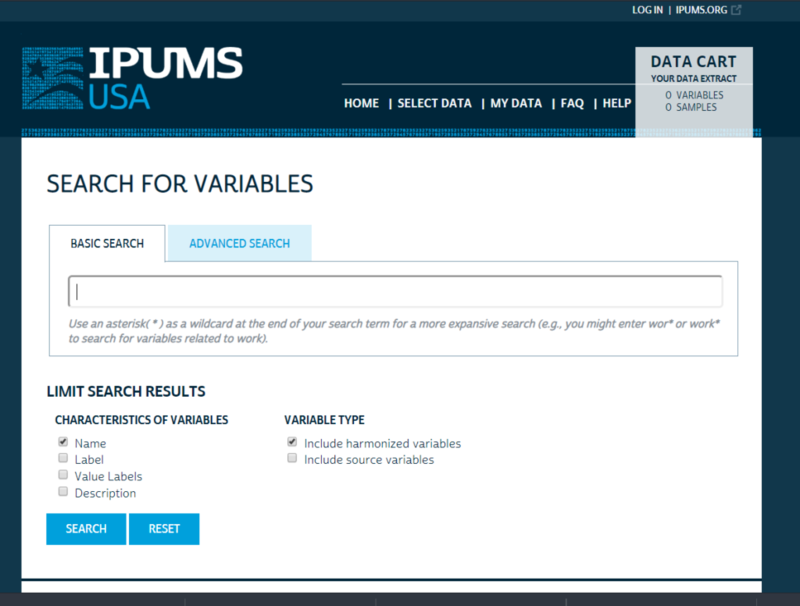 You may have noticed that the search tool for all IPUMS microdata projects has a new look. If not, you might also be the kind of person who doesn’t notice when your significant other gets a major haircut. Really, it’s fine. You are probably so busy admiring our dazzling data that you can barely notice the search tool. Now, however, is the time when we point out that we do have a new search tool, and you can fawn over it while we enthusiastically gush about the new options for basic or advanced search! The basic search tool is for those of you who are averse to change; it is the same as the previous search tool with a new coat of paint and a few new optional filters. 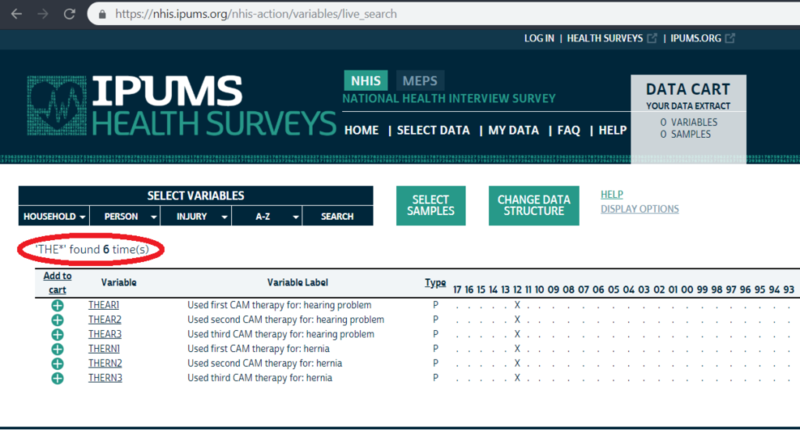 These filters allow you to easily limit your search results by only searching specific characteristics of variables (variable names, variable label, value labels, or the full variable description). For example, if you know that your variable of interest starts with “THE” but aren’t sure what the next character is, the option to not search the full variable description or label is going to make a huge difference in limiting your results. 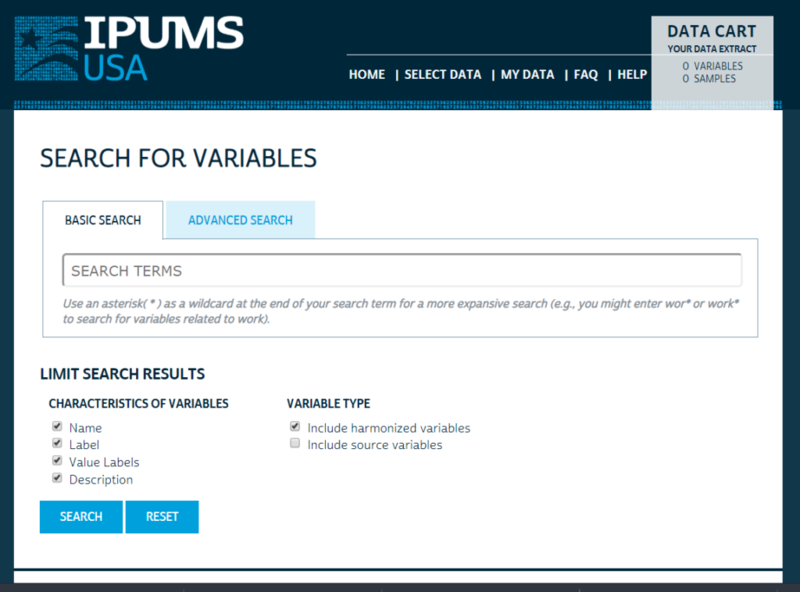 For IPUMS International and IPUMS USA, you may also search source variables (the original versions of the variables from the data provider), harmonized variables (IPUMS versions), or both. 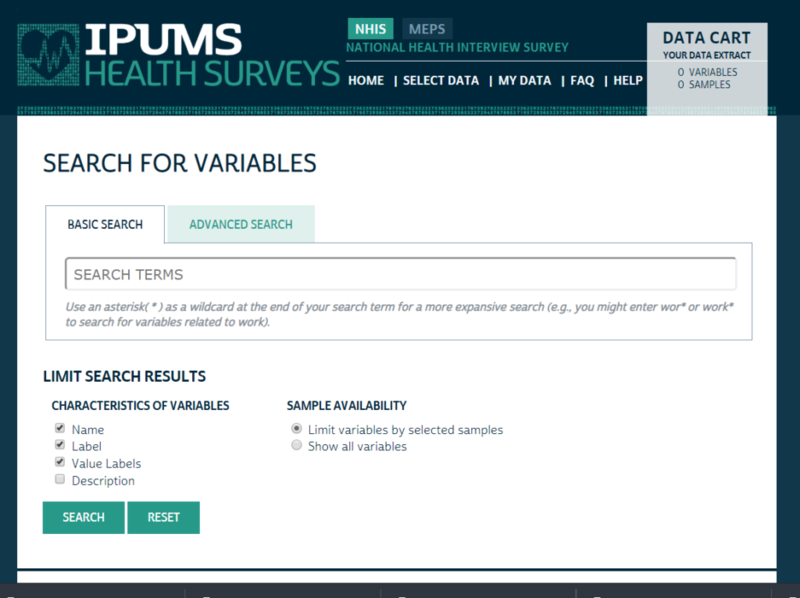 Finally, for IPUMS Health Surveys, the filters also allow you to limit your search based on selected samples; this will save you the task of wading through variables that might sound interesting, but aren’t available in your year of interest. Advanced search allows you to use all the same filtering options as the basic search, and adds bullion operators! Finally, you can specify that you want to search for variables related to soup that is gluten free AND organic, using a chicken OR vegetable base, but does NOT include beef. Wait—this just in—we have updated advanced search to use boolean operators. Sincere apologies. No soup for you. Only improved search capacity. While the basic search treats all terms entered as though they were separated by “OR” operators, advanced search allows for more nuance. To use the tool, enter all the terms that must be included in your results in the “AND terms” search box. The “OR terms” box is for any search terms that are optional to include. The “NOT terms” should contain search items that you want to actively exclude. The current search tool has a new look, but uses the same underlying search functionality. We are aware of a few limitations, and are exploring other tools that may help address some shortcomings. Here are a few tips and tricks to using the new search options more effectively. You must enter at least one term in either the “AND terms” or the “OR terms” search box. Start broad, and narrow your search as you go. Use the wildcard operator (*) to make your search more expansive (e.g., work* will yield results that include the terms work, working, and worked). Note that the wildcard operator only works at the end of a search term; you cannot begin a search term with a * or use it in the middle of your search term. Use quotes for exact match (e.g., “public assistance” instead of just public) to narrow your search. The relationship between your AND, OR, and NOT terms only applies within each variable characteristic (e.g., name, label, value labels, description). If a variable name contains one of your “AND” terms, and the description for that includes a “NOT” term, the variable will still be displayed in your search results. 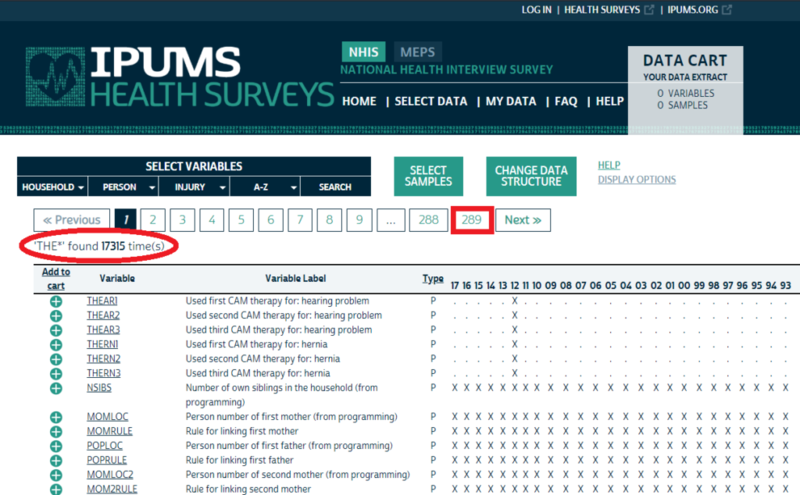 We want to hear back from you about the revisions to the IPUMS search tool, and how we can make it even better for you. The first step was a new look to highlight the additional search filtering options and boolean capabilities. The next step is identifying if a different tool can better serve the needs of our users. Let us know about any ongoing frustrations or search wishlist items. Share feedback on the User Forum or by emailing us at ipums@umn.edu. We can’t guarantee we will be able to address all of your concerns, but we can guarantee we won’t know about your frustrations if you don’t tell us about them!